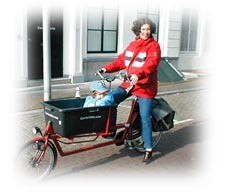 Bakfiets Cargobikes & Cargotrikes offer the solution! These are great workhorse utility Cargobikes/Cargotrikes, Tandem and Transport bikes. Great for shorter trips such as shopping, commuting and all round personal transport. They are extremely well-built and designed to really take the knocks. Their relaxed geometry make them very stable load carriers compared with conventional bikes. Load up two large panniers with shopping and you will appreciate the difference! The Bakfiets Cargobike is extremely manoeuvrable, convenient and light steering. The kids (or cargo) sit (or is placed) in a tough wooden box in front of the rider. Children are held securely with three-point harnesses; secure and safe.